The film Nandanar (1942) was based on the story of Thiru Nalaipovar, one among the 63 Nayanmar. I have seen this movie many times and never got bored eventhough the film was taken way back in 1942. The CDs are available and kindly give a try. I am glad to share the article by Randor Guy which appeared in The Hindu under Blast from the Past. I have also shared the opening song "Piravaa Varam Tharum" in the following link. The folk myth of a low-born farmhand, Nandan, and his deep devotion to Lord Nataraja of Chidambaram has been familiar among Tamilians. It was written as a musical titled “Nandan Charitram” by Gopalakrishna Bharathiar in the early 19th Century. Bharathiar’s work was immensely popular as Harikatha. Later, it was made into a play and a silent film in 1923 and 1930. When cinema began to talk and sing Tamil in 1931, it was produced as a film thrice, in 1933, 1935 and again in 1942. The most successful of them all was made in 1942 by Gemini Studios. Well-known Carnatic musician and one of the votaries of the Thamizh Isai Movement M. M. Dhandapani Desikar played Nandan. 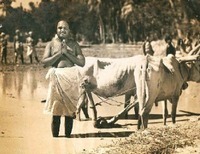 Famed Tamil film star Serukalathur Sama played the Brahmin landlord. As a marketing strategy, Vasan announced a trail-blazing Rs. 10,000-prize song contest for Nandanar. The moviegoer was asked to choose ‘Ten Best Songs’ in the order of merit and drop the answer sheet along with the counterfoil of the cinema ticket in a box provided at movie houses where the film was being screened. Vasan had the pre-chosen list of the songs deposited in a sealed envelope with the Indian Bank, First Line Beach (now Rajaji Salai), well before the prize scheme was announced. This was the first time such a scheme was introduced in South India and it contributed to the box-office success of the film. Remembered for: Its music and first-of-its-kind song-prize scheme!